You can get a bus and rail guide from Centro's Travel Office at New Street Station, or visit the Network West Midlands and National Express West Midlands websites. You must pay when you get on the bus or show a ‘travel pass’. If paying be aware that you will need the exact money, so please make sure you have plenty of small coins to hand (10p, 20p, 50p). A ‘Daysaver’ ticket is valid all day for unlimited travel on buses in Birmingham and costs £4.60. A single ticket costs £2.40 (correct at May 2017). When using taxis in the UK only use a black cab or licensed private hire car. Where possible pre-book a taxi. Never get into an unmarked car. Student travel passes for buses or trains can be purchased from Centro’s Travel Office or other outlets around the City Centre. Further information can be found on the National Express West Midlands website. 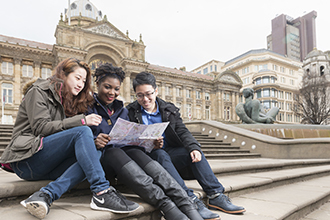 Find out more about the courses offered, local amenities and inter-campus travel.